There are several reasons to write letter to insurance company. The reason may be to insure life or insure property or for claiming damages occurred by fire / accident / natural causes. The letters written should be documented with facts and figures. 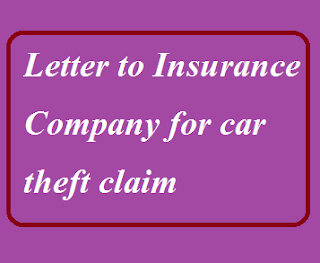 If you are in a situation to claim theft car insurance, you can follow the following letter format. I am writing this letter to inform you that my car TN 2804 (Hyundai Eon) was insured with your company on 26th March 2010 for a sum of Rs. 5,65,000 subject to depreciation annually. The said car was stolen on 07th October 2017 when I parked in a public park near the Velavan Super Market. The car was properly locked by a clutch lock system and the window panels are also secured. I have already taken the issue to handover to the police station by filing an FIR. It has been a month since the theft took place but the car has not been secured yet. So I kindly you to process and expedite prepayment of the insurance claim for the same. The necessary documents are being enclosed with this letter. Thanking you! Note: The above letter format is only for sample usage. You may need to give more details according to your situation.